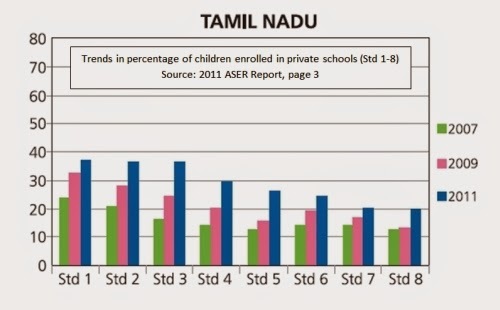 Yale Economic Growth Center's Tamil Nadu Socioeconomic Mobility Survey Part 1- Does improvement in school quality result in increased returns to education in India? There is an increasing emphasis on improving learning outcomes in discussions on education policy in India. With encouraging improvement in enrollment rates in primary schools over the past decade, it seems only natural that the focus is shifting to school quality. The immensely popular ASER reports (2005) have shown using standardized tests that students who have completed primary schools do not have the reading and mathematical skills they are expected to. This finding is the primary piece of evidence on which the focus on learning outcomes is often justified. This in-turn has led to a series of Randomised Control Trial (RCT) studies that demonstrate the impact of different interventions on learning outcomes, and their cost-effectiveness. The above evidence, when discussed in different policy platforms, is often considered as a sufficient basis to frame policies on. I argue here, that in order to translate results from research to policy, we need to take into consideration equilibrium effects, and demonstrate if the intervention is addressing the binding constraints. Without consideration of these factors through an empirical exercise, we cannot say if improving learning outcomes would result in improving the overall well-being in society. Given education is such a vast area of interest, different branches of economics have adopted different approaches to address its concerns. A labour economist, on coming across the above discussion on education may ask how does improvement in learning outcomes translate into changes in rate of returns to education. Rate of return to education is measured by assessing the value added in earnings of an individual (or household) with an additional year of schooling. Evidence from the United States of America indicate that exogenous improvements in learning outcomes bring about increased long-term earnings for the specific individual (Chetty et al, 2013). But from the policy point of view, there is still a need to know how important school quality is as compared to other factors in the context of India. The most recent estimates of returns to education in India by Fulford (2013) have found that the control for variation in school quality (learning outcomes) across different states is insignificant in determining returns to education. This gives all the more credence to the idea that we need to take other relevant factors into consideration when we discuss the importance of learning outcomes. Policy makers are interested in increasing returns from education to the society and not just the individual. When thinking about how an increase in school quality could result in increased earnings to the society, we need to take other factors into consideration. For instance, for a given cohort we may find that there are a limited set of jobs available. If one individual from the cohort secures a job, it comes at the expense of another individual. So what may be beneficial to individuals may not be beneficial to the society. Economists call this the ‘equilibrium effect’. One must also recognize that policy makers often have limited resources and a large number of alternative interventions that have shown to cause an increase in returns to education. For instance, Heath and Mubarak (2013) find that the exponential growth in the garment manufacturing sector in Bangladesh has had a larger impact on returns to education than the conditional cash transfer program that incentivizes households to send their children to school. Economists would argue that the reason behind the differences in impact of both interventions is because the real binding constraint lies in the labour market. From the policy point of view, this is an important piece of evidence that allows policy makers to choose the right intervention amongst alternatives. I discuss below how each of these factors needs to be measured, and their individual coefficients compared in order for us to be confident about the importance of interventions concerning school quality in improving social returns to education. In order to better describe the idea of equilibrium effects, think about a society with a certain fixed number of graduate jobs at a given point in time. In this society the salaries paid for the jobs is based on the number of people applying to the job (supply of skills), and the number of vacancies that need to be filled (demand for skills). Let us say the government decides to subsidize college education in such a scenario. This would result in many more people attending college. The intention behind providing a subsidy in such a scenario is to increase returns to education to the society from the increase in the number of people going to college. However, we did see earlier that salaries that students get after college graduation is dependent on the number of applicants for the job (demand for skills). So with more people going to college because of the subsidy there are more people applying for jobs and this would reduce the returns to education for a given individual due to a larger supply of skills. The empirical question is then, by how much? Heckman et al (1998) find that when equilibrium effects are taken into consideration the returns to education estimates are considerably reduced as compared with estimates that do not consider equilibrium effects of the intervention (subsidy). The literature on learning outcomes in India fails to consider these larger equilibrium factors into consideration – an important aspect from the policy point of view. Let us say in a given society the government makes a policy intervention that improves the overall school quality in the region. However, the labour market situation remains unchanged in its demand for low-skilled unproductive labour. This is possible as the labour markets are often working on their own set of parameters such as investment climate, ease of business, access to credit, etc. We may find that an improvement in learning does not increase the returns from schooling in such a scenario. This is because the binding constraint lies not in the education sector but in the labour markets. The literature on education has found that there are large externalities from interventions in other sectors such as agriculture, industry, and service sectors on returns to education. As any government has limited resources and has to choose between contending alternatives, it is always useful to ask if the intervention is addressing the binding constraint. This would allow the policy makers to decide whether they should be investing in improving the quality of education or in other alternatives. I provide here examples of studies that should be of interest in the Indian context because they are able to credibly address the question of external validity and find large effects from externalities. But the list is by no means meant to be exhaustive. i) Technology – Indian government introduced modern agricultural technology as part of the ‘Green Revolution’ in 1963. Considering the appropriate utilization of the new technology required the farmers to be literate, Foster and Rosenzweig (1998) study the impact the policy had on returns to education. They find that introduction of technology resulted in an increase in the returns to education. The study describes how the new technology increased the demand for education causing the overall returns to the society to rise. This is an example of how demand side interventions could possibly impact returns to education. ii) Labour market opportunities – There are a variety of studies that try to explore the impact of the growth in the Information Technology Enabled Services (ITES) in India on the demand for education. These demonstrate how growth in labour market opportunities can result in an increase in returns to education. Oster and Steinberg (2013) find that the presence of an ITES company in the vicinity causes an increase in enrollment rates locally. Munshi and Rosenzweig (2006) find that lower-caste girls opt for English medium schools if there is a presence of ITES in the area of their residence. Jensen (2012) in an experimental study finds that there is an increase in the number of years of schooling if the community is made aware of the ITES opportunities available. But the key here is to focus on high skilled labour opportunities. Atkin (2012) finds that growth in low skilled manufacturing jobs in Mexico results in a fall in years of schooling. This suggests the increase in low-skilled jobs in Mexico made the opportunity cost of leaving school very lucrative. Altogether, these studies point towards the possibility of high-skilled labour market opportunities in improving returns to education. From the above discussion, we can safely conclude that while the evidence currently available on learning outcomes is both valuable and encouraging, it is far from sufficient to frame evidence-based education policies in India. Given the numerous areas that can be affected by education policies, we still need much more evidence. Evidence looking at the role of labour market effects, and technology in determining educational outcomes, and the magnitude of their coefficients are possibly of immediate interest in this respect. While RCTs could provide us answers to many of these questions, a pooled panel data at the sub-regional level may do better in answering questions concerning equilibrium effects, and identifying binding constraints. It is also possible that different parts of India require different sets of constraints to be assessed given the variation in institutional environment. 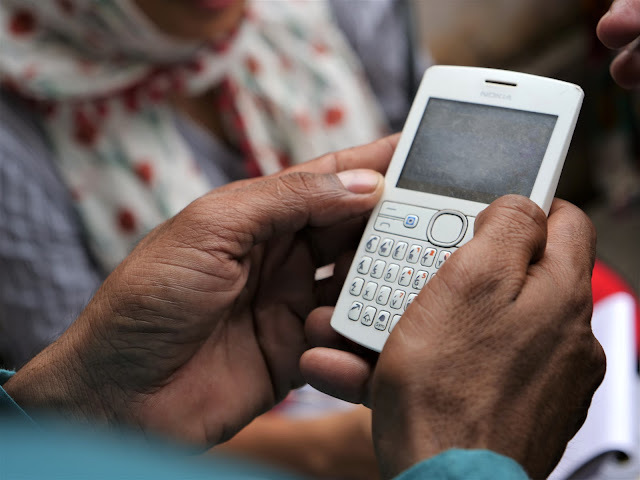 Yale Economic Growth Center's Tamil Nadu Socioeconomic Mobility Survey is uniquely placed in this context, as it is a data set that collects information, not only on households and individuals, but also community institutions. As it is data from within a state, it allows one to be less concerned about large variations in an institutional environment. The data is interesting as it also contains data on time-use for women, local prices and wages, local infrastructure along with household and individual data. In a sense it is able to combine features that are otherwise present in disparate surveys such as the Annual Survey of Industries, Time Use Surveys, National Statistical Sample Surveys, etc. This provides for a great possibility for interesting work on education, allowing us to answer many of the questions raised above. Atkin, David. (2012) “Endogenous skill acquisition and export manufacturing in Mexico”. No. w18266. National Bureau of Economic Research. Banerjee. R, Bhattacharjea. S. and Wadhwa. W, (2005) “ASER Reports”, ASER Center, New Delhi. Duflo, Esther. 2001. “Schooling and Labor Market Consequences of School Construction in Indonesia: Evidence from an Unusual Policy Experiment.” The American Economic Review 91 (4). Foster, Andrew D. and Mark R. Rosenzweig. 1996. “Technical Change and Human-Capital Returns and Investments: Evidence from the Green Revolution.” The American Economic Review 86 (4):pp. 931–953. Fulford, S (2014), “Returns to Education in India”, World Development, 59: pp. 434–450. Heckman, James J & Lochner, Lance & Taber, Christopher, 1998. "General-Equilibrium Treatment Effects: A Study of Tuition Policy," American Economic Review, American Economic Association, American Economic Association, vol. 88(2), pages 381-86, May. Jensen, R. 2010. "The (Perceived) Returns to Education and the Demand for Schooling." Quarterly Journal of Economics 125 (2): 515-548. Munshi, K., and M. R. Rosenzweig. 2006. "Traditional Institutions Meet the Modern World: Caste, Gender, and Schooling Choice in a Globalizing Economy." The American Economic Review 96 (4): 1225-1252. Oster, E., and B. M. Steinberg. 2013. "Do IT Centers Promote School Enrollment? Evidence from India." Journal of Development Economics 104: 123-135. PROBE Team, The. 1999. Public Report on Basic Education in India. New Delhi: Oxford University Press. Psacharopoulos, George and Harry Anthony Patrinos. 2004. “Returns to investment in education: a further update.” Education Economics 12 (2):111–134.